The Parador Sos del Rey Catolico of Aragonese character conserves the historical and artistic atmosphere of Sos del Rey Catolico. This town which is declared a Historical-Artistic area, was the birthplace of influential nobles and of the Catholic King. The Sos del Rey Catolico Parador is in a good location to wander in this medieval town and to visit the local areas of immense beauty. The Aragonese and Navarrese foothills of the Pyrenees can be made out in the distance. The regal and elegant interior offers beautiful views of the town from most of the communal rooms. Wood covers the interior columns and predominates in the Castilian style furniture. The large windows in the bedrooms and the modern decor gives the sense of space and light. 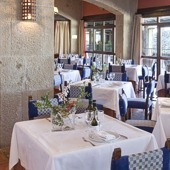 The menu of the Parador restaurant includes local gastronomic specialities such as veal, lamb, rabbit ”escabechado” (in a sauce made of vinegar, laurel, typical from Sos), and medieval cake. While in Sos visit the Sada Palace which is the birthplace of the Catholic King Fernando. Also visit the Church of San Esteban, the Parish Museum, the Santa Lucia little church, and the Sanctuary of Valentunana. Outside this historical villa, discover the Monumental ensemble of Uncastillo, and the Monastery of Leyre. Enjoy the celebrations and local feasts in Sos. They are held the second half of August, ”Romeria Valentunana”, and during Passover. The summer festivals take place every weekend of July and August. Discover the Sierras of Santo Domingo and Yesa as well as the valleys of Anso and Hecho. Hiking, hunting, and paragliding are among the activities that can be arranged. The dam of Yesa is also a place of interest where you can go sailing and swimming. The Parador of Sos del Rey Catolico has thirty seven twin bedded rooms, 6 double rooms, two single rooms, seven rooms with terrace, seven special rooms, five suites and two easy access rooms. 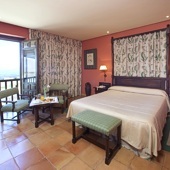 In the rooms you will find a telephone, satellite television, TV canal plus, safe and a mini bar. Also for the comfort of your stay there is heating, air conditioning, a restaurant and bar, currency exchange, lift, free internet access in communal areas, garage and parking facilities (without security and limited places), garden, satellite television and conference facilities if required. Distance from the nearest airport is approximately 50 kms and the nearest train station is 60 kms away. My husband and I stayed here for one night, after two nights at Hondaribbia. Very different place - the medieval village was incredible - how do people negotiate such narrow alleyways! We can see why it is a Global Heritage site. We had a drink in the cafe under the arches and could imagine the market there, with tradespeople using the measure in the wall! Ideal base for walkers. Comfortable room and good food as usual in a Parador! My wife and I stayed at your hotel in June. It was one of our favorites. We hope to come back. I would like to thank the staff for their hospitality, especially Laura. You all made our stay wonderful, in addition to the beautiful hotel, town and the country side. 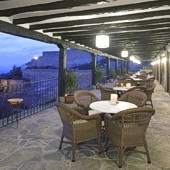 Parador de Sos Del Rey Catolico hotel in traditional Aragon style with views to the Pyrenees.